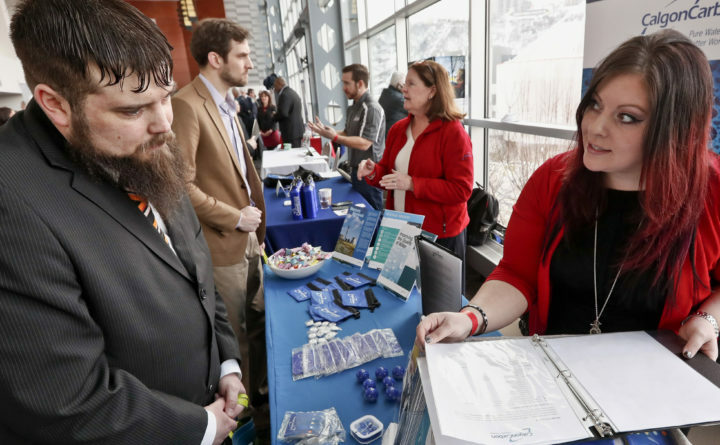 Visitors to the Pittsburgh veterans job fair meet with recruiters at Heinz Field in this Thursday, March 7, 2019, file photo. The civilian labor force unemployment rate rose in Maine’s three largest metropolitan areas during the past couple months but remained around the national average of 4 percent in January. Greater Bangor had the state’s highest civilian unemployment rate of 4.2 percent in January, according to monthly data released Friday by the Bureau of Labor Statistics. That’s up from 3.4 percent in December 2018, and 3.9 percent in January 2018. The Bangor metropolitan area includes most of Penobscot County. The Lewiston-Auburn metropolitan area saw a 3.9 percent unemployment rate in January of this year, up from the 3.1 percent in December 2018 and from the 3.5 percent in January 2018. The Portland-South Portland area saw unemployment rise, but had the lowest rate among the state’s three biggest metropolitan areas of 3.3 percent in January. The December rate was 2.6 percent and January 2018 was 3 percent. Overall, the state’s unemployment rate was 4.3 percent, up from the 3.4 percent in December 2018 and from the 3.9 percent in January 2018.